Animales Salvajes y de Zoológico Hay 1 producto. New to this Edition NEW! Two new co-editors (for a total of three editors) each lend their expertise on a wide range of new wild and zoo animal topics. NEW! 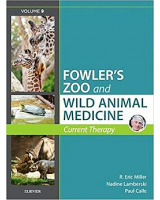 Section on emerging wildlife diseases includes chapters on MERS, SARS, Ebola in great apes, and a variety of other emerging wildlife diseases.